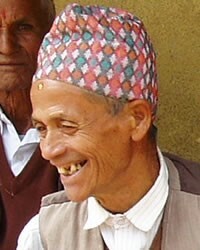 The Newah, one of the most cultured ethnic groups in Nepal, were the country's earliest inhabitants. Though the Newah are scattered throughout Nepal, they are primarily concentrated in the Katmandu Valley and in surrounding countries. They speak Newahi, a Tibeto-Burman language that has borrowed many words from Sanskrit, Maithili, and Nepali. 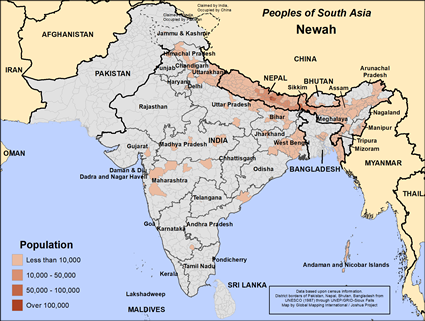 There are several dialects of Newahi, and it is written in the Devanagari script. Some Newars are self-consciously Hindu and others self-consciously Buddhist but most Newars would not recognise the distinction. For them it is more important to follow the traditions of the ancestors than it is to argue about religious affiliation or doctrine. Newar society is traditionally a caste-based society (as in India) with distinct caste-systems being centred in each of the old royal cities (Kathmandu, Lalitpur and Bhaktapur). Traditionally intermarriage was largely restricted to one's fellow caste members and boys were expected to follow the occupation of their fathers. Today the modern economy means there is theoretically freedom to follow almost any trade but inter-caste marriage is still widely frowned upon if not seriously punished. Katmandu Valley is located at the center of the India-Tibet trade route, and most of the Newah are skillful merchants and traders. Many others have found government jobs, and a few are farmers. Some of the farmers use tractors, but many still cultivate the land with short handled hoes called kus. Rice is the staple food of the Newah. It is eaten with soup, vegetables, and some meats. Unlike many other tribes in Nepal, the Newah are not usually recruited into the military. In recent years, Katmandu Valley has become the major political and administrative region of the nation. This has enabled more of the Newah to find employment in administrative areas and construction work. Tourism is also becoming an important industry. Most Newah settlements are built on elevated ground surrounded by farmland. The settlements look like small cities. Rows of three-story brick buildings stand along narrow lanes. The settlements have many ornate Buddhist and Hindu temples, which are-besides Mount Everest-the most important tourist attractions in Nepal. Newah societies are patrilineal, which means that the line of descent is traced through the males. Members of the same family line generally worship the same gods. Marriages are almost always arranged by the parents, and a mediator is used to complete the formalities. The artistic talents of the Newah are displayed in their sculptures and architecture. Inspired by Indian tradition, unique styles of palaces, temples, monasteries, fountains, and residential buildings have developed. They are often decorated with wooden carvings and equipped with stone or metal sculptures. The walls are covered with religious paintings, scrolls, and manuscripts. Drums, cymbals, and wind instruments are played during the religious festivals and rituals. Hinduism, Buddhism, and traditional ethnic beliefs are all a part of the Newah's religious lives. Newahs worship a multitude of gods, many of which are local gods and others of which are more clearly identified with the prestigious deities worshipped to the south, especially Shiva. They also believe in the existence of demons, hostile spirits the dead, ghosts, and witches. Traditional practices include the digu dya rituals, in which frogs are fed after rice planting. Cremation grounds, crossroads, and huge stones are thought to be favorite haunting places. Diseases are believed to be caused by the ill will of the "mother goddess," witchcraft, or evil spells. Treatments include reciting incantations, making offerings to the gods, and using herbs and other medicines. The Bible has been translated into the Newahi language, and several other Christian resources are available to the Newah at this time. Prayer is the key to reaching these precious people with the Gospel. * Ask the Lord to call people who are willing to go and share Christ with the Newah. * Ask God to grant wisdom and favor to missions agencies currently focusing on the Newah. * Pray that God will give the Newah believers boldness to share Christ with their own people. * Ask God to raise up prayer teams who will break up the spiritual soil of Nepal through worship and intercession. * Ask the Lord to bring forth a strong and growing Newah church for the glory of His name!View Newah in all countries.